He’s the former Weekend Today host who recently joined the cast of long-running Channel Nine current affairs show 60 Minutes. And Tom Steinfort has yet another reason to celebrate after he revealed his engagement to fiancee Claudia Jukic. Tom took to Instagram on Monday to share a sweet shot of the couple enjoying a vacation in Dubrivnik, Croatia. Standing on a boat amid crystal clear water, Tom and Claudia beamed broadly as they huddled close for their announcement snap. 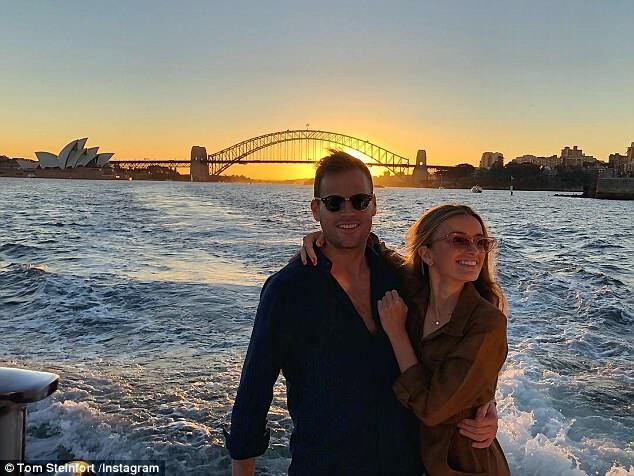 Tom also commented to Fox Sports presenter Emma Freedman, begging forgiveness for missing her Saturday nuptials to Charlie Rundle. ‘@emma_freedman hopefully this goes some way to excusing my absence on Saturday…..you looked amazing, and it looked like the best night! Love to you both x,’ he wrote. Claudia, who is the market editor for Australian Elle magazine also took to her Instagram to share the joyous news. Posting a similar image, Claudia’s showed the pair laughing heartily as they stood on their watercraft.